Link-Belt 160 X4 Excavator Delivers More Performance and Productivity LBX Company announces the Link-Belt 160 X4 excavator for the US and Canada, featuring an electronically-controlled 112 horsepower Isuzu engine that meets EPA Final Tier 4 requirements, without the need for a diesel particulate filter (DPF). The mid-size 160X4 is easy to transport and nimble enough to take on a variety of tasks, such as excavating foundations, placing pipe, stockpiling overburden, utility trenching, building roads and loading trucks. The ROPS and FOPS-certified cab provides improved operator ergonomics and comfort. A large, automotive-grade high-back seat offers unprecedented lumbar support and reclines at a 155° angle for a relaxed environment during breaks. Arm rests move proportionally with the console, which means that the distance and angle between joysticks and operator remains the same, no matter how the seat is adjusted. 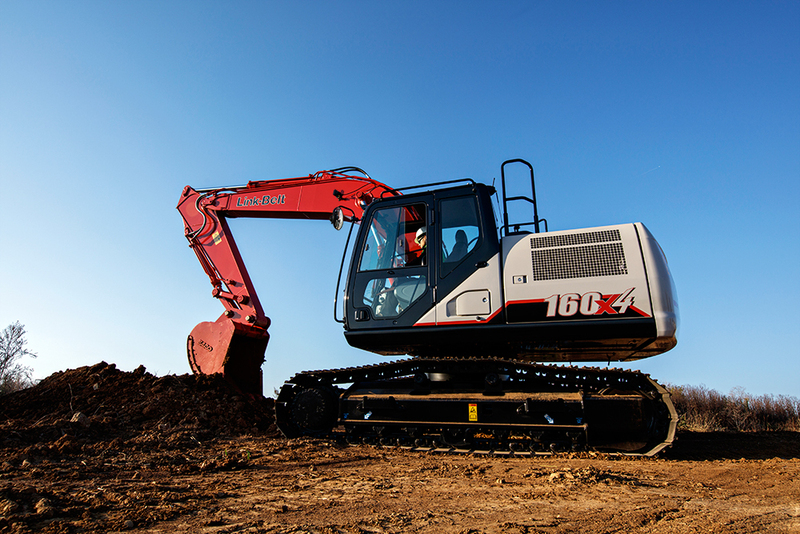 A large, 7-inch LED color monitor allows the operator to easily navigate a full menu of user-friendly controls to take full command of the excavator and attachments. The standard rear-view camera is accessible through the monitor, displaying a panoramic view of the worksite from the rear of the machine, with sight guidelines that can be turned on or off by the operator. Rear and side lights can also be added to the camera system. Other notable new cab features include: dual halogen cab lights (with optional LED lighting); a cup holder and storage areas for cell phones and other small items; newly designed joysticks with easy-to-hold grip and radio mute buttons; new MP3 audio input, Bluetooth-enabled for hands-free communication. A standard control pattern changer so every operator can feel right at home. Servicing is a snap, with convenient, ground-level access to all routine service points, including sample ports for engine and hydraulic oil. All service ports are easily accessed via hand-turn knobs. RemoteCARE® GPS-enabled telematics system allows 24/7 remote monitoring and security. The system tracks and records routine and major service intervals, as well as machine health, providing more flexibility and control when determining when and where to service machines. It also lets you be more proactive if potential failure conditions arise; flashing diagnostic codes on the monitor quickly alert the operator to potential trouble and an e-mail alert is automatically sent. The system also provides machine location in real time for better job supervision and remote security monitoring. A 3-year subscription is included at no extra charge. The 160 X4 features improved boss shaping on boom and arm pins to reduce stress and cast boom tips for improved reliability. Structural improvements on the lowers include a 32% thicker travel motor case, 9% more stroke recoil spring, 50% wider idler hub and a shape change on side frames for easier cleaning. The Standard Warranty Package includes: 1 yr./1,800 hrs. Full Machine Warranty; 2 yr./3,000 hrs. Engine Warranty (2 yr./2,000 hrs. electrical parts); 3 yr./5,000 hrs. Powertrain Warranty; 3 yr./10,000 hrs. Machine Structures Warranty; 5 yr./3,000 hrs. EPA Emissions Warranty, along with participation in the X4 Fluid Analysis Program for the life of the warranty.